Kevin T. Kerrigan is the Senior Vice President, Automotive Office and the Senior Automotive Adviser to the State of Michigan with the Michigan Economic Development Corporation. In this position, Mr. Kerrigan’s primary focus is international business development for the MEDC’s Automotive Office. Working with the world’s automotive manufacturers, he is promoting Michigan’s automotive industry, building and maintaining strong international client relationships, nurturing economic development and assisting foreign based companies who choose Michigan for their future expansion. 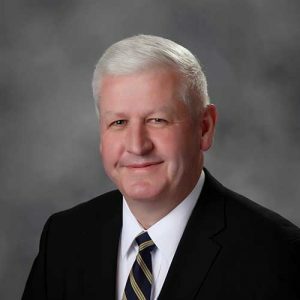 Mr. Kerrigan comes to state government with over 35 years of executive experience in the global automotive sector encompassing both technical and executive management in North America, Europe and Asia. Mr. Kerrigan led his own automotive design and engineering company for 20 years and has worked at an executive level for Tier 1 automotive suppliers. As a hands-on executive, Mr. Kerrigan has a proven track record of developing and growing companies within the automotive industry. Previous positions Mr. Kerrigan had prior to joining MEDC include: President of Eurotech Design, Inc., a Michigan-based full service engineering organization; President of Adaptive Systems, a turnkey robotic integration company; Chief Engineer at Tata Technologies; and Principal Engineer for International Automotive Components based at their Advanced Development Center in Troy, Michigan. Mr. Kerrigan was educated in the United Kingdom, where he completed a full indentured British Mechanical Engineering Apprenticeship.